Apple technology moves fast, and that, sadly, means a lot of peripheral kit can become redundant quickly. Take this mouse, for example. It works really well, is super slim and therefore travels brilliantly, but just won't work with the latest Apple notebooks. It needs a type-II PCMCIA card slot to live in and take a charge from; neither the MacBook nor the MacBook Pro has one. Apple did away with the PCMCIA card slot on its laptops in favour of the narrower ExpressCard/34 slot in 2006, and the rest of the industry is headed that way, too. For this mouse you will need a PowerBook. 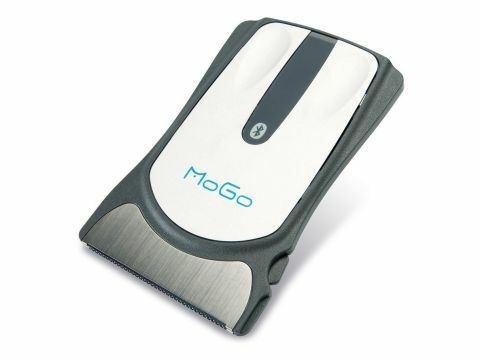 The MoGo mouse is barely thicker than a credit card, and clearly this is its unique draw. If you take your laptop everywhere with you and have a Bluetooth connection, then this mouse could make a great travelling companion for your Mac. It looks pretty sharp when you eject it from the PCMCIA card slot to kick off a presentation, and because of its diminutive size, it hardly takes up any space in your laptop bag. It will slip into a wallet, although keeping it tucked away in the PCMCIA slot is a neater solution. The mouse needs a full charge before you can pair it to the Bluetooth receiver in your PowerBook. Once it's charged, an LED glows green on the outside lip, meaning you're ready to connect. This is done by flicking down the little stand, which doubles as the power switch, then holding down the connect button on the bottom of the mouse. In the OS, turn on the Bluetooth receiver from the menu bar or in System Preferences. The signal for the mouse is good inside a 10ft range., but the battery life seems very short at around 30 minutes before you need to recharge. Because of its small size, there's no scroll function, but you do get left- and right-click functionality. The MoGo is a responsive mouse and tracks well. The flat form does take a bit of getting used to, but we had no real complaints about its performance.